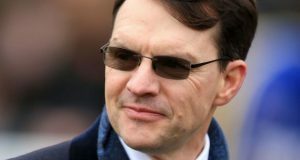 Aidan Patrick O’Brien became the youngest trainer in Ireland when, at the tender age of 26, he accepted the job of succeeding the erstwhile Master of Ballydoyle, Vincent O’Brien, in 1996. However, as private trainer to Irish business magnate John Magnier and his Coolmore Stud associates, Michael Tabor and Derrick Smith – to whom, collectively, O’Brien affectionately refers as ‘the lads’ – he has enjoyed phenomenal success. O’Brien quickly established himself as one of the leading trainers, not just in Ireland, but in the world. He became Irish Champion Flat trainer, in terms of prize money won, for the first time in 1999, with 102 winners and €2.02 million in total prize money and has retained the title in every season since. In 2017, he enjoyed his most successful season so far, in pecuniary terms, with €6.61 million in total prize money and broke the world record, previously held by the late Bobby Frankel, for Group 1 or Grade 1 winners in a single season, with 28. True to form, in 2018 he did better still, in monetary terms, with €6.81 million in total prize money and smashed another record, this time for the number of winners trained in an Irish Flat season, which previously stood at 139. All in all, O’Brien has saddled over 300 Group 1 winners, obviously far too many to mention individually, but he has also been British Champion Flat trainer on six occasions, in 2001, 2002, 2007, 2008, 2016 and 2017, and has an enviable record in British Classic races. His total haul of 32 victories is made of nine in the 2,000 Guineas, four in the 1,000 Guineas, six in the Derby, seven in the Oaks and six in the St. Leger. At the time of writing, he is also the third most successful trainer in the history of the Breeders’ Cup with 12 winners to his name, while other worldwide victories include the Cox Plate, Canadian International, Prix de l’Arc de Triomphe, Hong Kong Vase and Arlington Million, to name but a few.